Knebworth has played host to some of Britain’s biggest gigs – from Oasis and U2 to Robbie Williams. So a concert this week by rock legends The Who is hardly out of character. What might have been rather less normal by Knebworth standards, however, were the signs directing punters to the polo field or clay pigeon shooting. The occasion to which the sprawling Hertfordshire country estate was playing host was aimed at those better known for their refined pursuits – and their financial acumen – than their rock antics. With a mixture of live music, champagne tents and debates about the benefits of investing in Guernsey, this is Hedgestock: the 1960s hippy-themed conference for people working in one of the most maligned, or at least misunderstood, financial sectors. 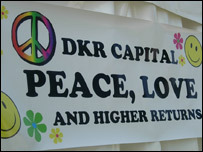 More than 4,000 hedge fund managers and investors paid £500 a ticket to rock up to this event, where peace and love met wealth and ambition. 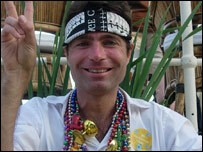 Ditching their suits, and in some cases even their Blackberries, some participants draped themselves in hippy beads. Others chose badges featuring personalised puns, drawn from the rich comedy pool that is fund management. “I’m An Alpha Male,” read one, punning on the name of a measure of investment success. “I can’t believe it’s not Beta,” said another, in similar vein. While the wristbands at the entry gate and the beer in plastic cups gave Hedgestock an authentic festival feel, that was where the similarities ended. Instead of smoking substances more commonly associated with festivals, chunky Cuban cigars were being handed out – rather than passed around – to those perched on bean bags outside the chill-out tent. Meanwhile, stalls targeted their cash-rich audience with holiday homes in Portugal, tailor-made golf clubs and Breitling watches. And judging by the BMWs, Mercedes and Porsches lining in the car park, not too many had hitchhiked to the venue. The premise for the event, says Simon Ruddick of organisers and hedge fund consultants Albourne Partners, is simple. “Most conferences are boring,” he says. “The part most people enjoy at a work event are the coffee breaks and the drinks afterwards. While some privately expressed concerns the event would be awash with marketing staff rather than big-hitters such as the fund managers, the general murmurings suggested that a healthy balance had been struck, with talk of networking opportunities and deals done. “It has definitely been a success for us,” said David Clarkson, head of prime services for Credit Suisse in London, one of the sponsors. One glance at the rota of scheduled lectures and debates, though, and you’d be forgiven for thinking the speakers may have been on Pimms when crafting the titles for their talks. “Fund Managers are from Mars, Institutional Investors are from Venus” might not have been everyone’s favourite way to spend half an hour. Whether the industry feels it has gained will determine whether Hedgestock becomes an annual gathering. 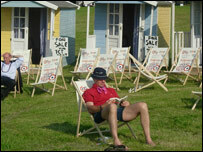 But the biggest winner will be Teenage Cancer Trust, which is receiving all the event’s profits. It was the charity’s links with Roger Daltrey which led to the Hedgestock highlight – the show by The Who, in their first live gig together for over two years. Another band playing on the day had members almost as old as Pete Townshend and co.
What they lacked in panache was made up for with effort and glimpses of showmanship – just as you’d expect given they were a group of hedge fund managers. Away from the stage, teams called the Hunters, Gatherers and Scavengers fought out a triangular cricket tournament, while exhibitors pulled no punches trying to draw people to their tents. Feel the need for speed? Then drive a Formula One racing car simulator with Henderson Global Investors. Got a head for heights? How about scaling the BNP Paribas climbing wall? Or fancy some boys’ toys? Well, the six-track Scalectrix at the Armajaro stall is for you. Then there was table football and a bucking bronco – not to mention the laser clay pigeon shooting. The suits are back on now, of course – and investors are probably hoping that managers will be aiming at financial targets with just as much gusto. Previous articleWhat is health insurance?